SYNOPSIS: Can summer be truly summer without Cousins Beach? REVIEW: I had a hard time writing this review because I really did try to do away with the spoilers. It's hard describing things without giving anything off. It's Not Summer Without You is a sequel to The Summer I Turned Pretty. In my review of The Summer I Turned Pretty I mentioned that the most interesting part of the book for me was the ending, it was enough to make me want to read the next book. And so here it is. I think everyone deserves fair warning: The book is mildly heartbreaking but in a good way (if that's even possible). 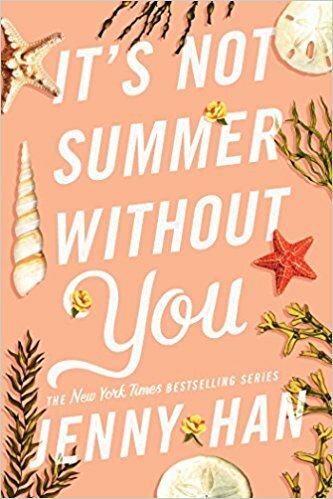 Futhermore, Jenny Han told the story better this time. I think having a few chapters in Jeremiah's perspective helped give depth to the story; it was like a balance was created. Because quite frankly, reading an entire book written in Belly's perspective alone was tiring. Add that to the heartache and viola! A well-shaped plot. However (there's always the however), inasmuch as this book was better than the first, there were still a few things that needed ironing out. For example it wasn't really clear why Conrad and Belly broke up during prom. Sure he was having issues but it just felt so sudden and off. Then again maybe Han intended for that effect to get through so we can sympathize with Belly. It worked for me though! I felt Belly's pain when they broke up because the description was vivid and not because I can relate to it in anyway. Kapish? Just the same, I felt like Conrad becoming distant wasn't as gradual as it should've been seeing that Belly was still excited and hopeful about prom. Another one is Belly's sudden interest in Jeremiah. (Bella Swan complex much?) I know they've been bestfriends since forever but with the way Belly's obsessed (in love, potatoe potatow) with Conrad, it was hard for me to grasp how the heck she can suddenly find Jeremiah attractive that way. (I wonder if a kiss can easily turn things around like that) Again, I'm just looking for the gradual change that can logically explain things. (then again maybe my think-logically-mindset is just ruining the experience for me) Or maybe Belly was just so eager to get over and stick it to Conrad that she just went for it. Possibly. I think the most creative part in the book was the cliffhanger set "two years later." It will definitely leave you curious and wanting more. It sure did make me read the third book to see how it got there so that's gotta be good. Overall, it was definitely better than the first one and it will leave you wanting to read the last book. SIDE NOTE: Can I just say? I'd totally recommend this to every brokenhearted girl (or boy) out there. Plenty of emo quotes to fuel your Twitter/Facebook. Tee hee.